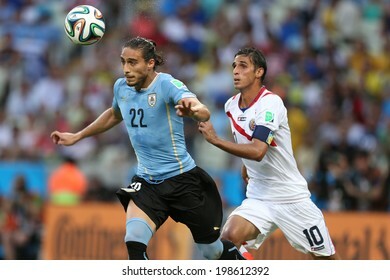 7,989 WorldCupEditorial2014 stock photos, vectors, and illustrations are available royalty-free. 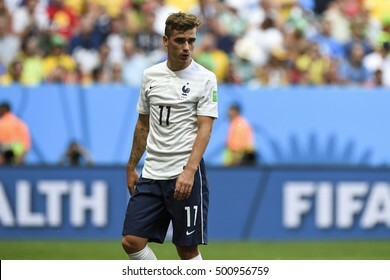 SAO PAULO, BRAZIL - June 12, 2014 : Neymar of Brazil takes a penalty during the World Cup Group A opening game between Brazil and Croatia at Corinthians Arena. No Use in Brazil. 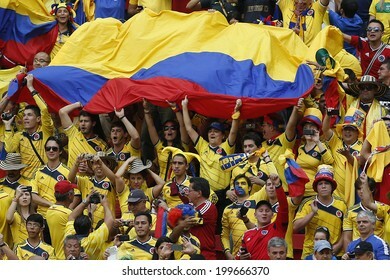 se in Brazil. 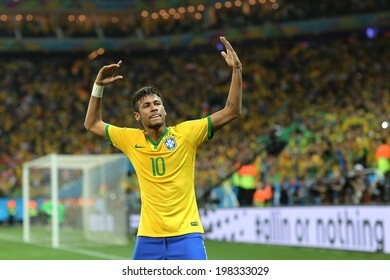 SAO PAULO, BRAZIL - June 12, 2014: Neymar of Brazil celebrates during the World Cup Group A opening game between Brazil and Croatia at Corinthians Arena. 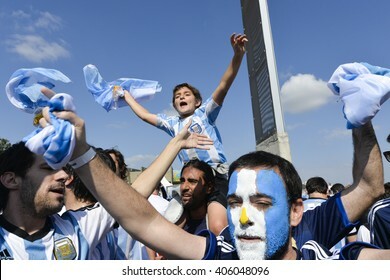 No Use in Brazil. 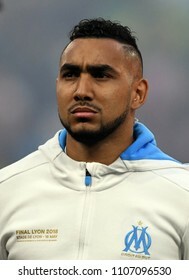 LYON, FRANCE - 16 MAY, 2018: Dimitri Payet pictured during the UEFA Europa League Final between Olympique de Marseille and Atletico de Madrid at Stade de Lyon. 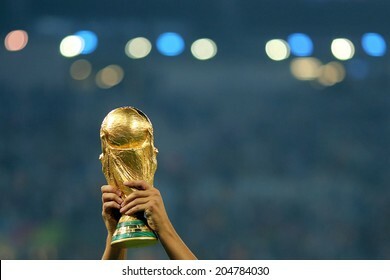 RIO DE JANEIRO, BRAZIL - July 13, 2014: The World Cup Trophy is lifted during the celebrations after the 2014 World Cup Final game between Argentina and Germany at Maracana Stadium. 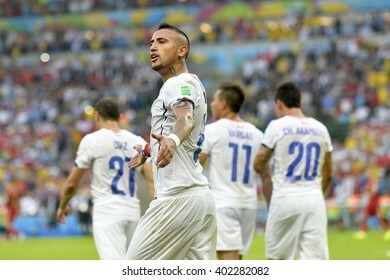 NO USE IN BRAZIL. 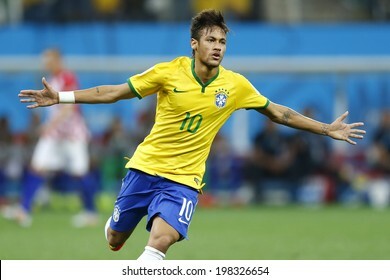 SAO PAULO, BRAZIL - June 12, 2014: Neymar of Brazil celebrates a goal during the World Cup Group A opening game between Brazil and Croatia at Corinthians Arena. 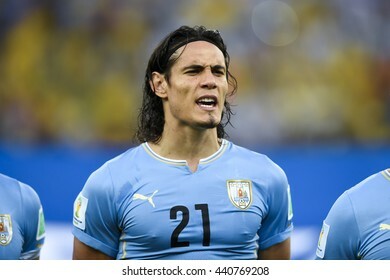 No Use in Brazil. 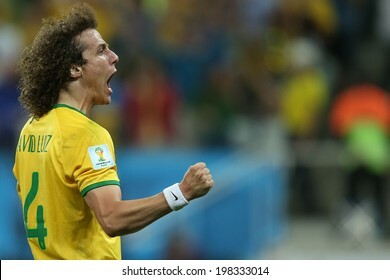 SAO PAULO, BRAZIL - June 12, 2014: Luiz of Brazil celebrates a goal during the World Cup Group A opening game between Brazil and Croatia at Corinthians Arena. 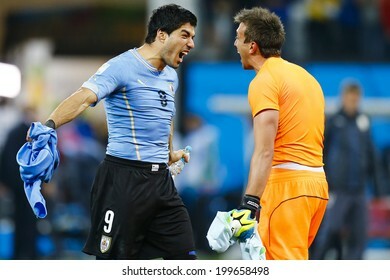 No Use in Brazil. 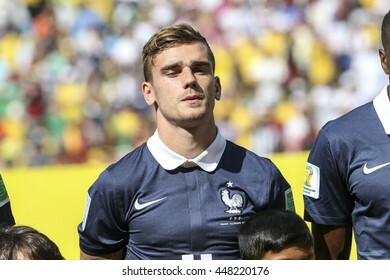 Brasilia, Brazil - June 30, 2014: Antoine GRIEZMANN of France on the World Cup 2014 Round of 16 game between France and Nigeria at Estadio Nacional Mane Garrincha in Brazil. 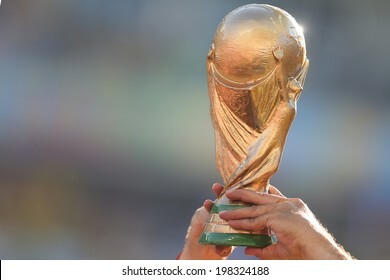 SAO PAULO, BRAZIL - June 12, 2014: A replica of the World Cup being showcased during the World Cup Group A opening game between Brazil and Croatia at Corinthians Arena. 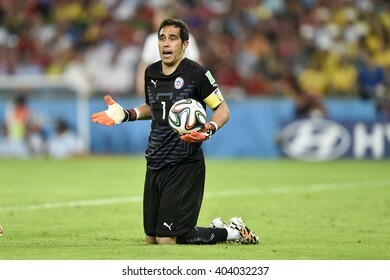 No Use in Brazil. 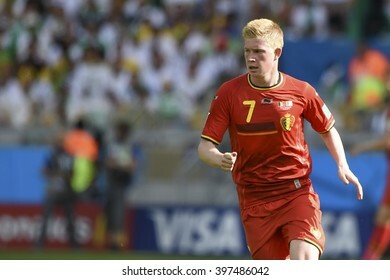 BELO HORIZONTE, BRAZIL - June 17, 2014: Kevin DE BRUYNE of Belgium, compete for the ball during the World Cup Group H game between Belgium and Algeria at Mineirao Stadium. 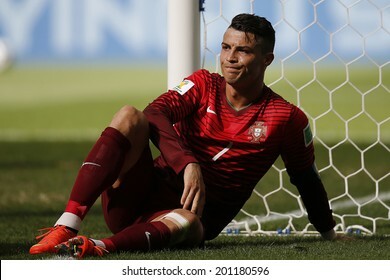 SAO PAULO, BRAZIL - June 12, 2014: American singer Jennifer Lopez performing during the opening ceremony of the FIFA 2014 World Cup at Corinthians Arena. 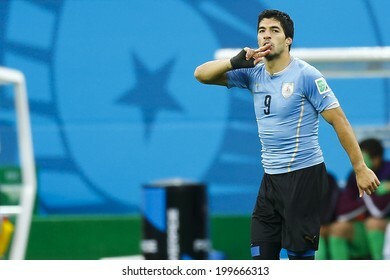 No Use in Brazil. 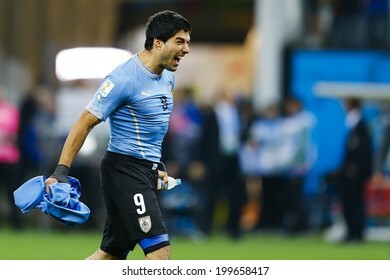 SAO PAULO, BRAZIL - June 19, 2014: Luis Suarez of Uruguay celebrates after scoring a goal during the 2014 World Cup Group D game between Uruguay and England at Arena Corinthians. 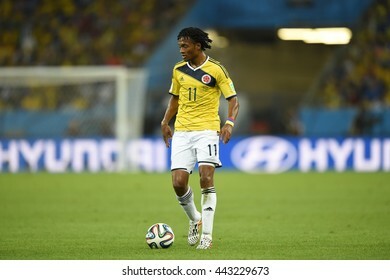 No Use in Brazil. 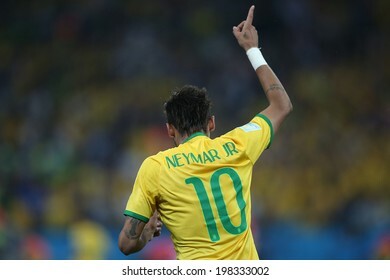 SAO PAULO, BRAZIL - June 12, 2014:Neymar (#10) of Brazil celebrates during the World Cup Group A opening game between Brazil and Croatia at Corinthians Arena. 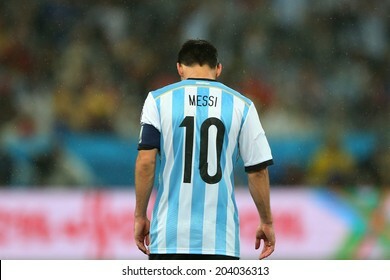 No Use in Brazil. 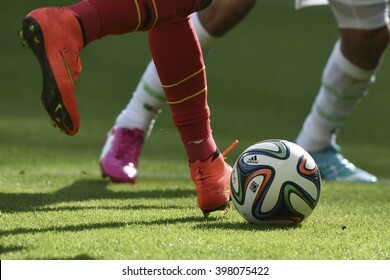 BELO HORIZONTE, BRAZIL - June 17, 2014: Kevin DE BRUYNE of Belgium compete for the ball during the World Cup Group H game between Belgium and Algeria at Mineirao Stadium. 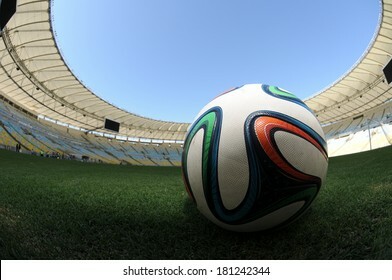 RIO DE JANEIRO - 10 MARCH 2014 - Brazuca ball on the field at MaracanÃ?Â£ Stadium on 92 days countdown for 2014 FIFA World Cup Brazil. 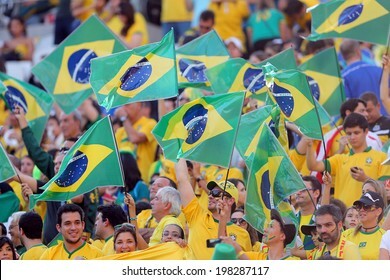 SAO PAULO, BRAZIL - June 12, 2014: Fans waving Brazilian flags during the World Cup Group A opening game between Brazil and Croatia at Corinthians Arena. 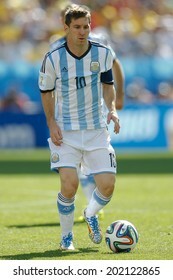 No Use in Brazil. 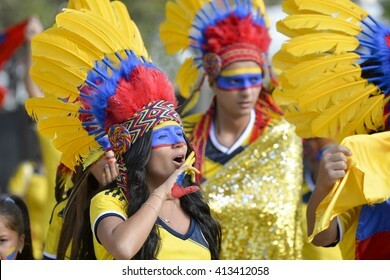 BRASILIA, BRAZIL - June 19, 2014: Soccer fans celebrating at the 2014 World Cup Group C game between Colombia and Ivory Coast at Estadio Nacional. 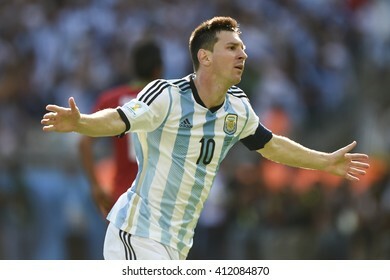 No Use in Brazil. 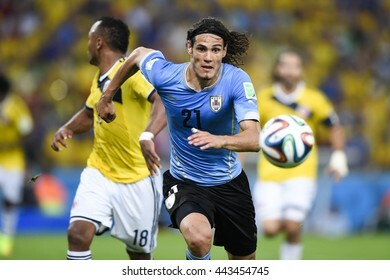 RIO DE JANEIRO, BRAZIL - June 28, 2014 World Cup Round of 16 game between Colombia and Uruguay at Maracana Stadium. 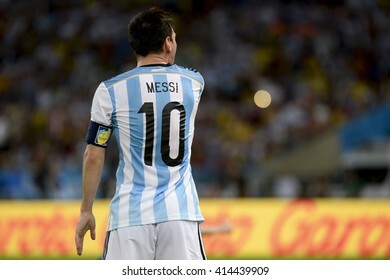 No Use in Brazil. 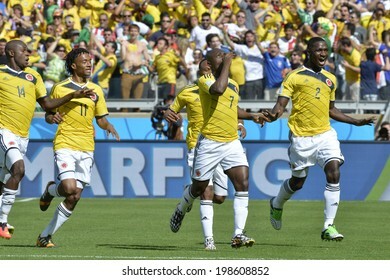 BELO HORIZONTE, BRAZIL - June 14, 2014: Pablo ARMERO of Colombia celebrates after scoring a goal during the 2014 World Cup Group C game between Colombia and Greece at Mineirao Stadium. 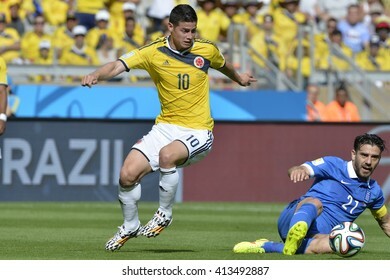 SAO PAULO, BRAZIL - June 12, 2014:Neymar of Brazil in action during the World Cup Group A opening game between Brazil and Croatia at Corinthians Arena. 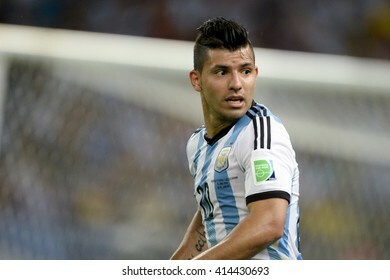 No Use in Brazil. 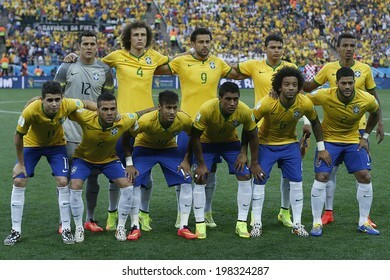 SAO PAULO, BRAZIL - June 12, 2014: Brazil team posing for a photo during the FIFA 2014 World Cup opening game. 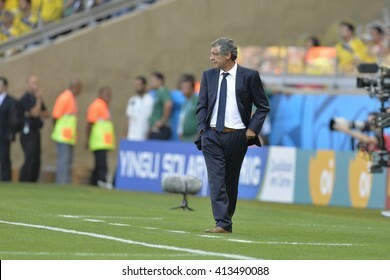 Brazil is facing Croatia in the Group A at Corinthians Arena. 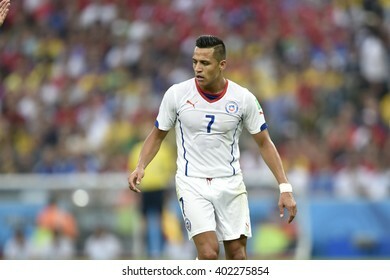 No Use in Brazil. 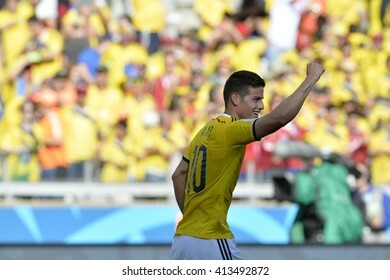 SAO PAULO, BRAZIL - June 12, 2014: Oscar of Brazil celebrates a goal during the World Cup Group A opening game between Brazil and Croatia at Corinthians Arena. 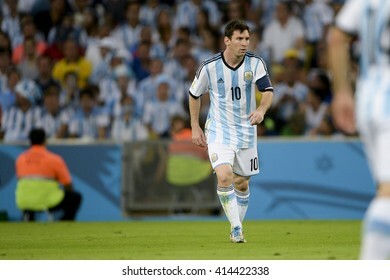 No Use in Brazil. 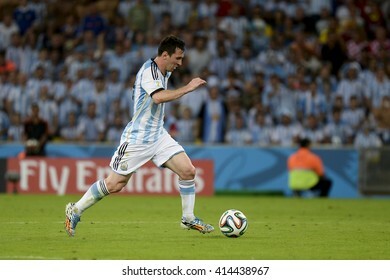 SAO PAULO, BRAZIL - July 9, 2014: Lionel Messi during the 2014 World Cup Semi-finals game between the Netherlands and Argentina at Arena Corinthians. 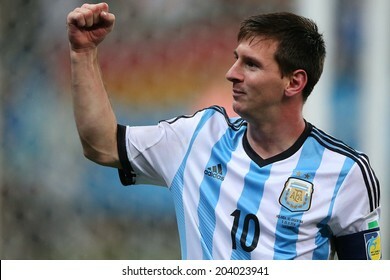 NO USE IN BRAZIL. 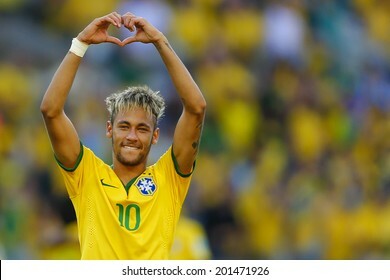 SAO PAULO, BRAZIL - June 12, 2014: Neymar of Brazil celebrates during the World Cup Group A opening game between Brazil and Croatia at Corinthians Arena. 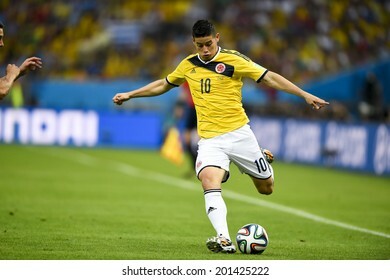 No Use in Brazil. 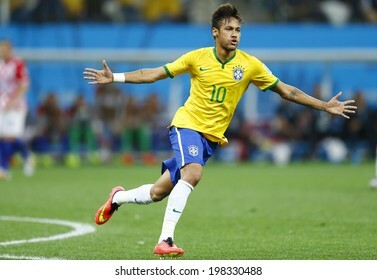 SAO PAULO, BRAZIL - June 12, 2014:Neymar of Brazil celebrates during the World Cup Group A opening game between Brazil and Croatia at Corinthians Arena. No Use in Brazil. 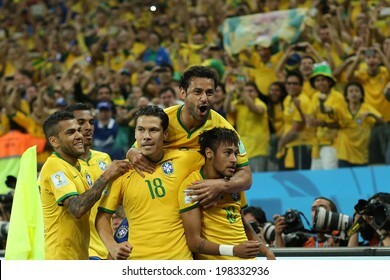 SAO PAULO, BRAZIL - June 12, 2014: Neymar (r) and Brazilian players celebrate during the World Cup Group A opening game between Brazil and Croatia at Corinthians Arena. No Use in Brazil. 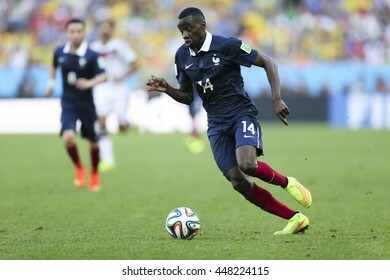 Brasilia, Brazil - June 30, 2014: Fan on the World Cup 2014 Round of 16 game between France and Nigeria at Estadio Nacional Mane Garrincha in Brazil. 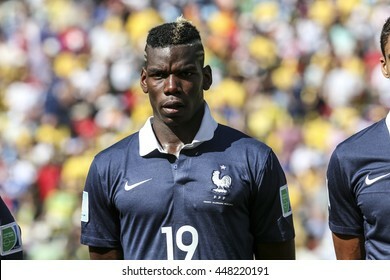 SAO PAULO, BRAZIL - June 12, 2014: Neymar (r) of Brazil celebrates during the World Cup Group A opening game between Brazil and Croatia at Corinthians Arena. 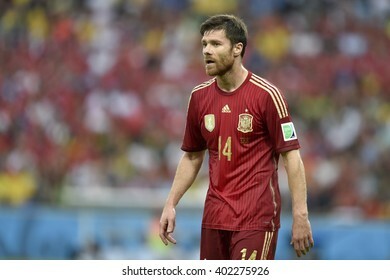 No Use in Brazil. 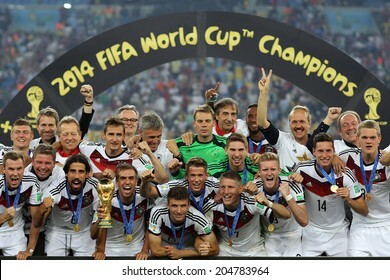 RIO DE JANEIRO, BRAZIL - July 13, 2014: Players of Germany celebrate after winning the 2014 World Cup Final at Maracana Stadium. 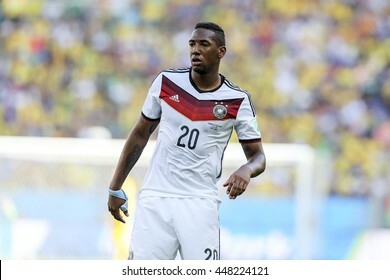 Germany are the Champions of The World. 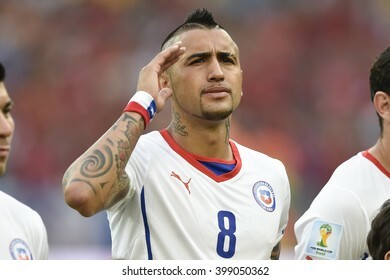 NO USE IN BRAZIL. 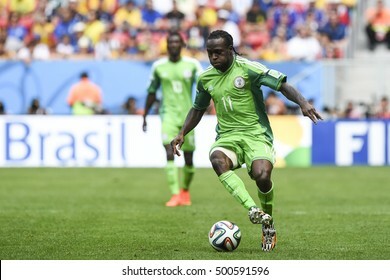 Brasilia, Brazil - June 30, 2014: Victor MOSES on the World Cup 2014 Round of 16 game between France and Nigeria at Estadio Nacional Mane Garrincha in Brazil. 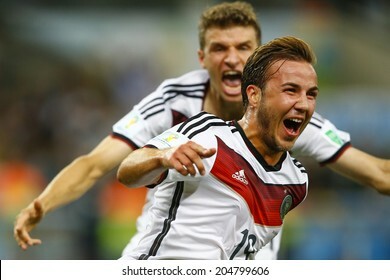 RIO DE JANEIRO, BRAZIL - July 13, 2014: Gotze of Germany celebrates his score during the 2014 World Cup Final game between Germany and Argentina at Maracana Stadium. NO USE IN BRAZIL. 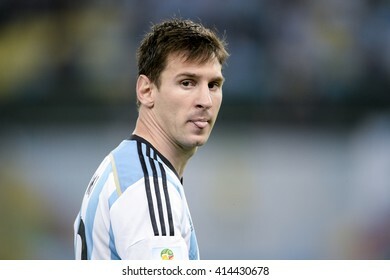 SAO PAULO, BRAZIL - July 1, 2014: Lionel Messi during Argentina National Anthem at the 2014 World Cup Round of 16 game between Argentina and Switzerland at Arena Corinthians. 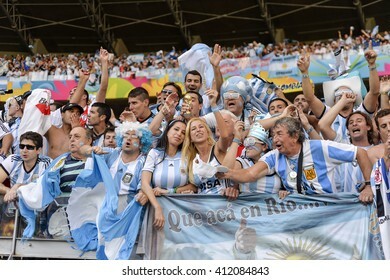 No Use in Brazil. 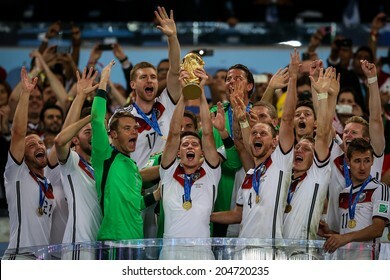 RIO DE JANEIRO, BRAZIL - July 13, 2014: Players of Germany celebrate with the Trophy after winning the 2014 World Cup Final game between Germany and Argentina at Maracana Stadium. 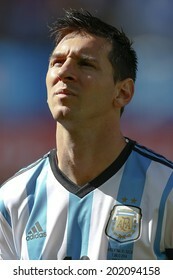 NO USE IN BRAZIL. 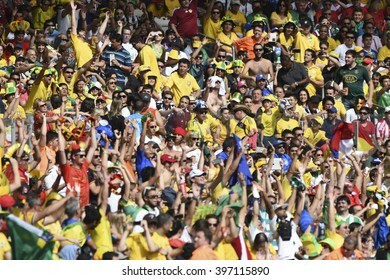 BELO HORIZONTE, BRAZIL - June 17, 2014: Fans during the World Cup Group H game between Belgium and Algeria at Mineirao Stadium. 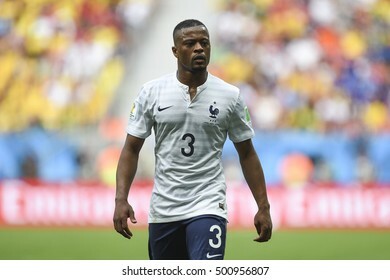 Brasilia, Brazil - June 30, 2014: Patrice EVRA of France on the World Cup 2014 Round of 16 game between France and Nigeria at Estadio Nacional Mane Garrincha in Brazil. 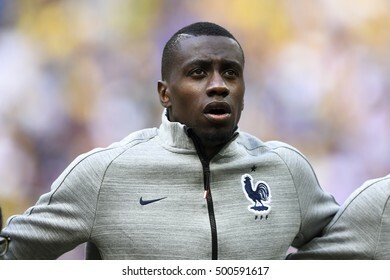 Brasilia, Brazil - June 30, 2014: Blaise MATUIDI of France on the World Cup 2014 Round of 16 game between France and Nigeria at Estadio Nacional Mane Garrincha in Brazil. 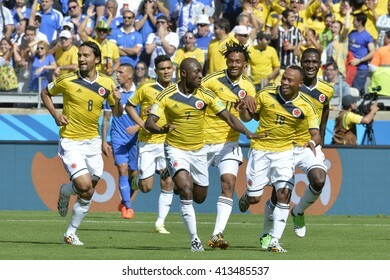 BRASILIA, BRAZIL - June 15, 2014: Ecuador players celebrate after Enner Valencia scores during the World Cup Group E game between Switzerland and Ecuador at Mane Garrincha Stadium. 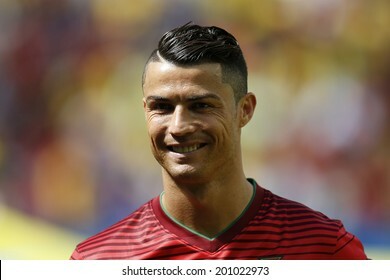 No Use in Brazil. 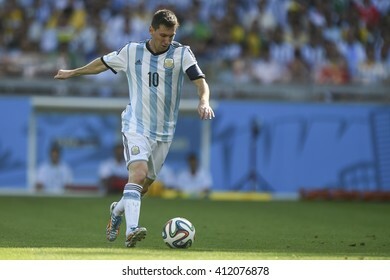 SAO PAULO, BRAZIL - July 1, 2014: Lionel Messi of Argentina during the Round of 16 game between Argentina and Switzerland at Arena Corinthians. 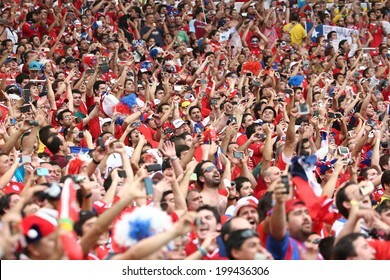 No Use in Brazil. 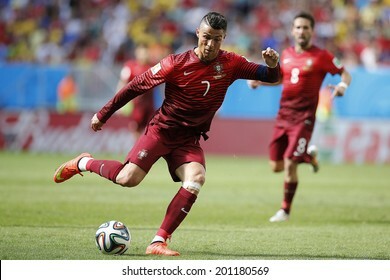 BRASILIA, BRAZIL - June 26, 2014: Cristiano Ronaldo of Portugal during the 2014 World Cup Group G game between Portugal and Ghana at Estadio Nacional Mane Garrincha. No Use in Brazil. 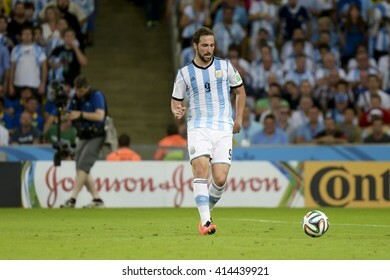 BELO HORIZONTE, BRAZIL - June 17, 2014: Ball during the World Cup Group H game between Belgium and Algeria at Mineirao Stadium. 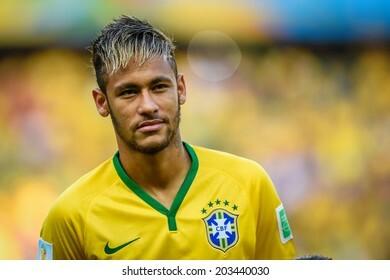 FORTALEZA, BRAZIL - July 4, 2014: Neymar of Brazil during the National Anthem at the FIFA 2014 World Cup quarter-final game between Brazil and Colombia at Estadio Castelao. 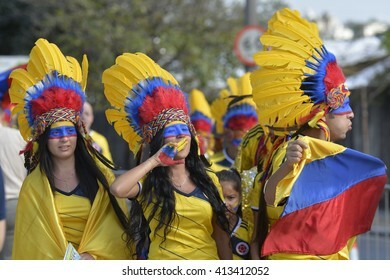 No Use in Brazil. 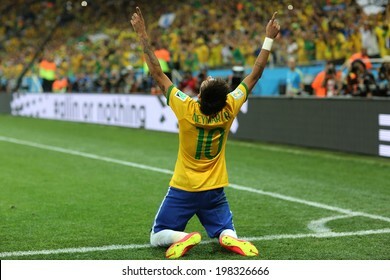 BELO HORIZONTE, BRAZIL - June 28, 2014: Neymar of Brazil celebrates winning the 2014 World Cup Round of 16 game between Brazil and Chile at Mineirao Stadium. No Use in Brazil. 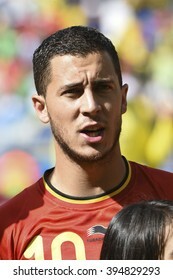 BELO HORIZONTE, BRAZIL - June 17, 2014: EDEN HAZARD OF BELGIUM during the national anthem at the 2014 World Cup Group H game between Belgium and Algeria at Mineirao Stadium. 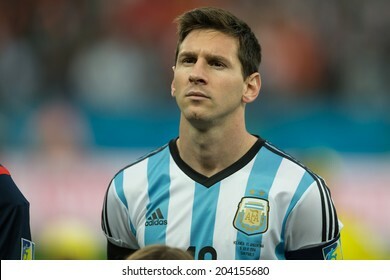 SAO PAULO, BRAZIL - July 9, 2014: Lionel MESSI during Argentina National Anthem at the 2014 World Cup Semi-finals game between Argentina and Netherlands at Arena Corinthians. 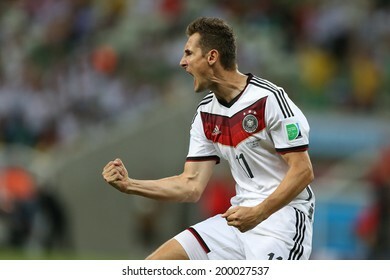 FORTALEZA, BRAZIL - June 21, 2014: Klose of Germany celebrates during the World Cup Group G game between Germany and Ghana at Estadio Castelao. 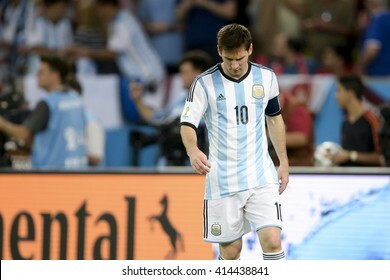 No Use in Brazil. 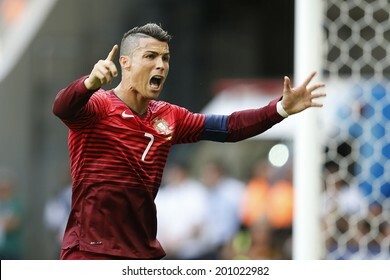 BRASILIA, BRAZIL - June 26, 2014: Cristiano Ronaldo of Portugal celebrates after scoring a goal during the game between Portugal and Ghana at Estadio Mane Garrincha. 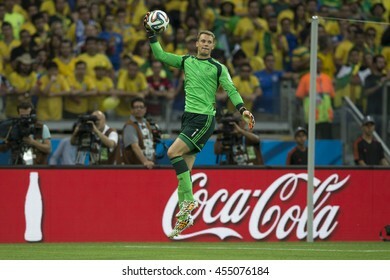 No Use in Brazil. 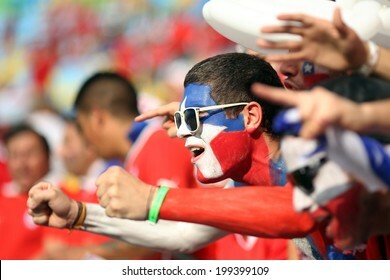 RIO DE JANEIRO, BRAZIL - June 18, 2014: Soccer fans celebrating at the 2014 World Cup Group B game between Spain and Chile at Maracana Stadium. No Use in Brazil. 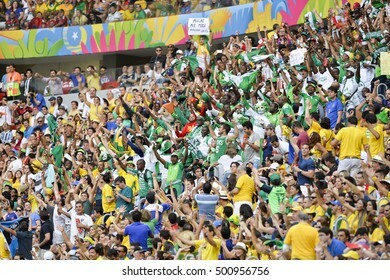 BRASILIA, BRAZIL - JUNE 23, 2014: Fans during the World Cup Group A game between Cameroon and Brazil in the National Stadium. 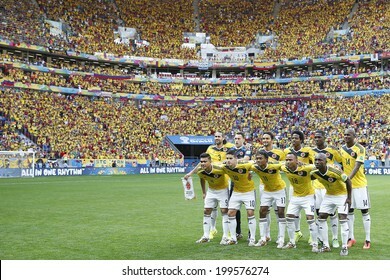 NO USE IN BRAZIL. 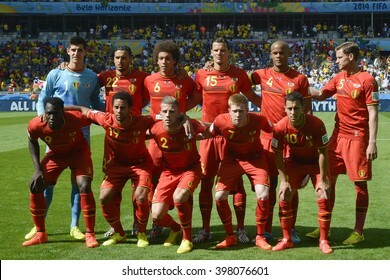 BELO HORIZONTE, BRAZIL - June 17, 2014: Belgium Team during the World Cup Group H game between Belgium and Algeria at Mineirao Stadium. 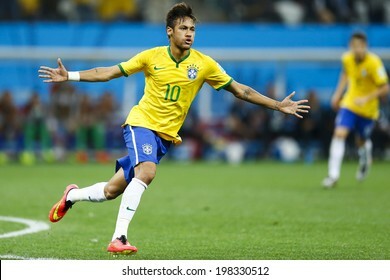 BRASILIA, BRAZIL - June 23, 2014: Neymar of Brazil celebrates after scoring a goal during the 2014 World Cup game between Brazil and Cameroon at Estadio Nacional Mane Garrincha. No Use in Brazil. 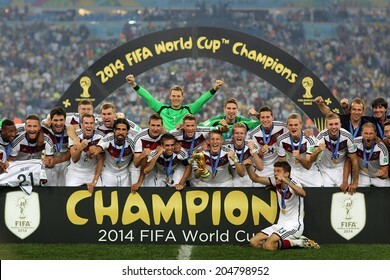 RIO DE JANEIRO, BRAZIL - July 13, 2014: Team Germany posing for a photo with the Trophy after winning the 2014 World Cup Final game between Argentina and Germany at Maracana Stadium. NO USE IN BRAZIL. 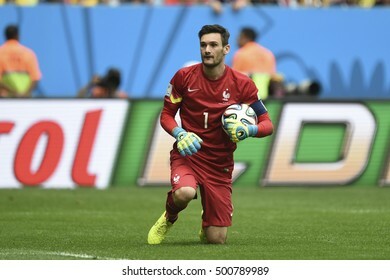 Brasilia, Brazil - June 30, 2014: Hugo LLORIS of France on the World Cup 2014 Round of 16 game between France and Nigeria at Estadio Nacional Mane Garrincha in Brazil. 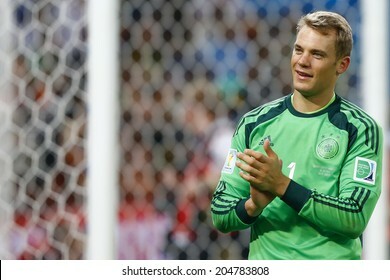 RIO DE JANEIRO, BRAZIL - July 13, 2014: Neuer of Germany celebrates winning the 2014 World Cup Final game between Argentina and Germany at Maracana Stadium. NO USE IN BRAZIL. 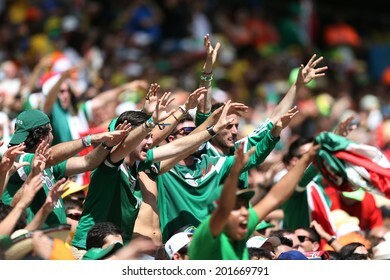 FORTALEZA, BRAZIL - June 17, 2014: Mexican fans celebrating during the World Cup Group A game between Brazil and Mexico at Estadio Castelao. No Use in Brazil. 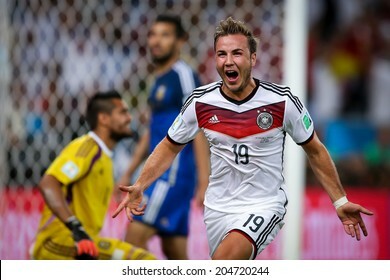 RIO DE JANEIRO, BRAZIL - July 13, 2014: Mario Gotze of Germany celebrates after scoring the victory goal during the 2014 World Cup Final game against Argentina at Maracana Stadium. NO USE IN BRAZIL. 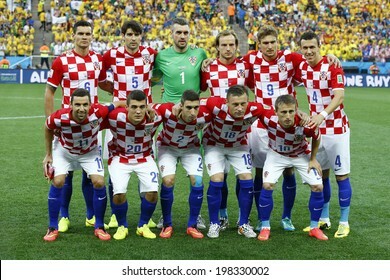 SAO PAULO, BRAZIL - June 12, 2014: Croatia team posing for a photo during the FIFA 2014 World Cup opening game. 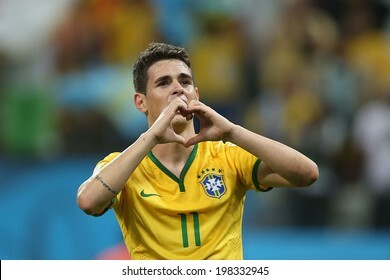 Brazil is facing Croatia in the Group A at Corinthians Arena. No Use in Brazil. 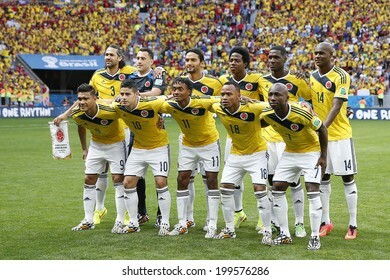 BRASILIA, BRAZIL - June 19, 2014: Colombia team posing for a photo during the FIFA 2014 World Cup. 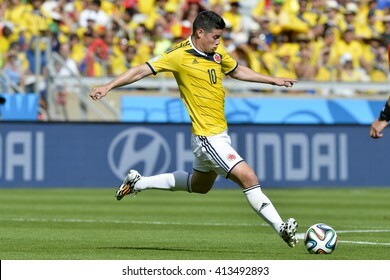 Colombia is facing Ivory Coast in the Group C at Estadio Nacional Mane Garrincha. NO USE IN BRAZIL. 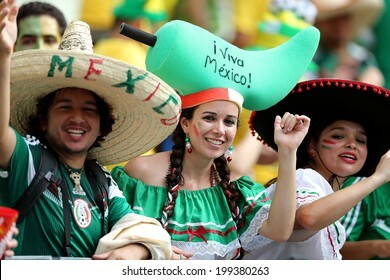 FORTALEZA, BRAZIL - JUNE 29, 2014: Fans of Mexico during the World Cup Round of 16 game between the Netherlands and Mexico in the Castelao stadium. 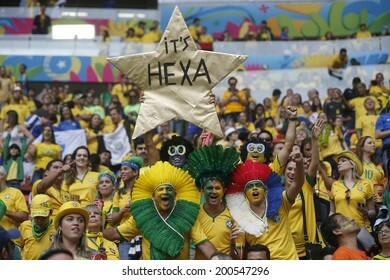 NO USE IN BRAZIL.